Children play on the slide in the playground in Queen’s Park, Bolton. jeez! Look how high that slide is! Don’t I recall quite a large one in Moss Bank park when I was younger (90’s). Don’t get slides like that any more, they are now just 3 steps of the ground! I have slid down that slide. So high then not like that now. 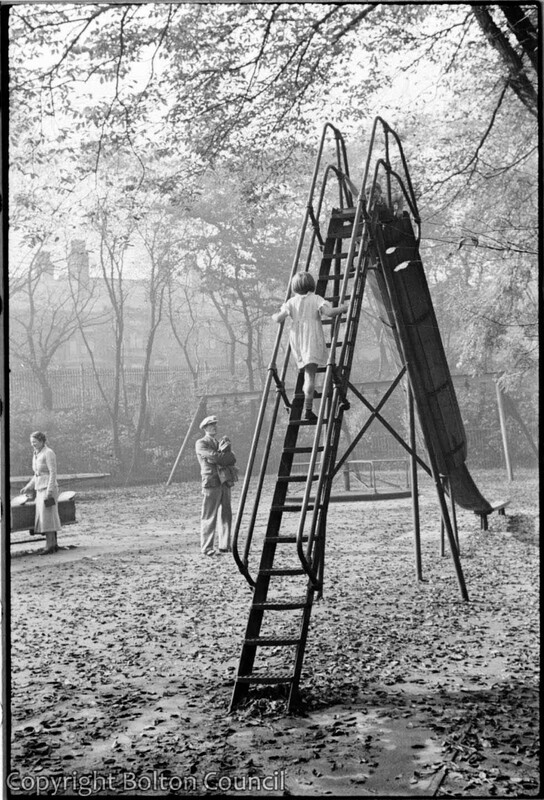 I remember climbing up the steps of that slide , the problem was that I had no head for heights even at age three and it was very very high! When it was my turn to go down , I just couldn`t do it and had to push my way past the long queue behind me. They were non too pleased at the “scaredy cat” and let me know it!